Talking Book and Braille Librarians from 23 states will gather in Columbia, South Carolina at the 2012 KLAS Users' Conference to discuss how to improve patron service and incorporate new technologies while working within budget and staff constraints. Librarian of Congress James H. Billington recently announced the appointment of Karen A. Keninger as director of the National Library Service for the Blind and Physically Handicapped (NLS), effective March 26, 2012. Come learn about technology solutions for the blind: JAWS® screen reading software, Braille displays, scanning and reading - and more! 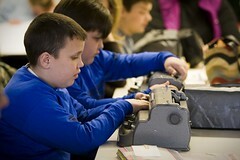 The fourth annual Braille Challenge to be held in South Carolina will take place at the State Library's Talking Book Services Library on February 2, 2012. You can now apply for a NFB of SC scholarship by downloading the application from the NFB web site at www.nfbsc.net. The deadline for applications is June 1 and the awards will be made at the August convention to be held in Spartanburg. The Talking Book Services will be closed January 16th in observance of a state holiday. TBS will be closed from Friday, December 23 through Tuesday, December 27. The library will reopen on Wednesday, December 28. TBS will also be closed Monday, January 2 2012. The library will reopen on Tuesday, January 3. 2012 Braille calendars are now available. Contact TBS (1-800-922-7818) to get one today. Limited supplies available.